Dr. Elbert T. Knight, pastor of Mount Carmel Baptist Church, Portsmouth, VA., matriculated at Norfolk State University, thereafter, furthered his education at Gateway Bible College, International Seminary, and Virginia Union University School of Theology. He holds a Bachelor of Theology Degree and was bestowed an honorary Doctorate of Divinity Degree from Providence Theological College and Seminary. He accepted his call to the gospel ministry in 1976. He was assistant to the pastor at the New Light Baptist Church from 1976-1979 in Virginia Beach, VA. and pastored Mount Bethel Baptist Church from 1979-1981 in Virginia Beach, VA. In September, 1981 he was called to pastor Mount Carmel Baptist Church in Portsmouth, VA. The ministry is vibrant and in a growth mode due to the energetic and dynamic teachings of this man of God. Much has been done in the way of the church structure, interior renovations, and his vision through the addition of the Victory In Jesus Substance Abuse Ministry. 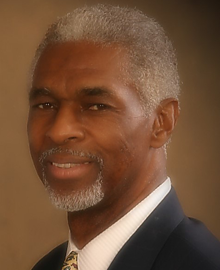 Dr. Knight’s affiliations include: the committee for the Hampton Roads Prayer Summit, Consumers Care Advisory Team, and Advisory Team for the Drug Enforcement Administration, and for the Portsmouth Drug Court, Board Member for Providence Bible College and Theological Seminary. He is, also, the recipient of the Liberty Bell Award given by the Portsmouth Bar Association; the highest award presented to a non- lawyer and, also, received the distinguished Dr. L. D. Britt Community Service Award and various awards from Community Urban Leagues and outreach ministries. Dr. Knight is known for his outstanding humanitarian philosophy, and is always seeking to address the social ills that plague society. He is ever challenging the church to stand up and fulfill its obligation to help right the wrong inflicted upon those who are disenfranchised, the marginalized, and those who have no voice in the decision making process. Dr. Knight’s motto is: “If I can help somebody as I pass along, then my living shall not be in vain. Dr. Knight is married to the former Alfreda Edmonds and is the father of two (2) children, a son, E. T., Jr. and a daughter, Monique. He is the proud Grandfather of Dequana, Kenesha, Myles, Laci, and Mason.